The 3D movie The Monkey King premiered Jan 19, 2014 in Beijing, a new Chinese blockbuster which has made a wave for movie-goers across China. For the foreigners who stay in Beijing and want to enjoy the newest Chinese movies, this one should be one of their targets. The brief storyline of the movie lies below. 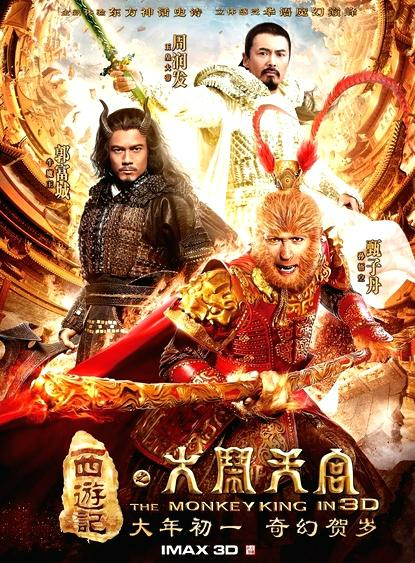 The Chinese magic movie The Monkey King originates from the first eight chapters of the world-famous novel Journey to the West. The first eight chapters tell us a story that after Monkey King has learned the 72-body-transformation skill, he wants to become an immortal but is then considered enemy of Heaven after his childhood friend Nine Tail Fox was killed and has wrongly made friends with Bull Demon King. To return his beloved wife Iron Fan Princess and son Red Child who had been staying in his mother’s womb for 300 years before birth to Heaven, he incites Monkey King to make chaos in Heaven with him, which finally forces the ruler of the Three Worlds (Heaven, Earth and Hell according to Chinese traditional culture) Jade Emperor to fight against them accompanied by God Erlang and other gods of Heaven. Then, a series of wars breaks out between gods and demons. The movie will be in theaters in the forms of 3D, IMAX-3D and DMAX on the first day of the 2014 Spring Festival across China. Learn more from english.visitbeijing.com.cn. Monkey King, hero of the novel Journey to the West, is a universally known character because of numerous valiant acts he does during the pilgrimage of his master, two non-biological brothers and himself to India. Havoc in Heaven is but one of these valiant stories, but Monkey King has left a very deep impression on people’s minds during this period across China. The director once said, “Monkey King is the only novel character well known by both Easterners and Westerners.” To create a new image for Monkey King—the super oriental hero, the special effects makeup team consisting of 70 members from Hollywood had made 20 inverted molds before the movie was accomplished.